We all know that content is king when it comes to online marketing. If you have a blog, an e-newsletter or want to create an online content-driven site, Publisha (beta) helps you do it easily. Publisha is new way to distribute your content across many platforms in one fell swoop. Whether you want to create a new digital publication or support an existing blog or magazine, Publisha is for you. Thereâ€™s no need for existing layout or PDFs. Publisha lets you use social media to gain new readers, and â€“ coming soon â€“ turn on the built-in revenue streams to make money. Basically, Publisha provides a way for you to get your content out to more people in more places, with the ability to monetize it. The end result of using the service is one you can achieve on your own. You probably already do if you actively use your online content for marketing. But Publisha streamlines the process. Publisha uses one dashboard to allow you to push your content out to different places, including a web site, Facebook, iPhone/iPad and Twitter (coming soon). This can all be accomplished with other services, but the value comes from the all-in-one aspect. It takes just a few clicks to publish everywhere. Publisha also includes a built-in adserver and features like affiliate setup, selling subscriptions and mailing list creation are on the way. You can use Publisha to create your content outlets from scratch, or import your RSS to give your existing content more reach. I took it for a test drive with my existing e-newsletter, and there are a few features I really loved. In the multi-tasking nature of online business, you canâ€™t beat having just one place to go to get your content out there. Getting published is as easy as adding your content and selecting where you want it to go through the content manager shown below. 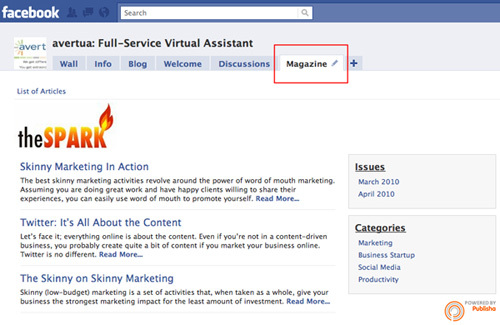 The Facebook publishing element is awesome.Â It’s not just a link sharing service like others that already exist. Publisha actually allows you to create your own custom Facebook app that contains all of your content in full form, right on Facebook. This is an excellent way to boost readership and engagement on your fan page and for your brand. The screenshots below shows the content I added being pulled directly into the Facebook app on one of my fan pages. It also creates a blog for you with your content, if you don’t already have one. You can select from eight themes and have access to the source code so you can customize it. 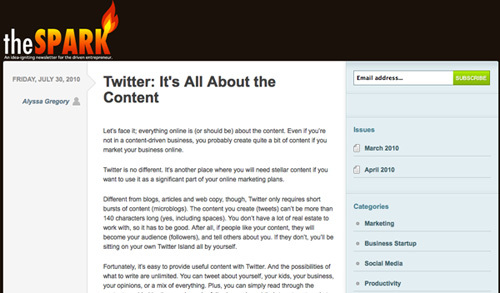 The screenshot below shows the blog I created in my test drive. In my evaluation, if you already have a blog with your content and use tools to feed it into Twitter and Facebook, this service may be overkill for you. If youâ€™re starting from scratch, however, this is a great way to start a publication from your blog component to Facebook and into other outlets. And once the monetization feature launches, I can seen even more value in using Publisha. Do you think Publisha would fulfill a need for you? If you’ve tried it out, what do you think about it? Publisha is free to use with 20% of your ad space going to Publisha. There are other pricing plans with add-ons available.